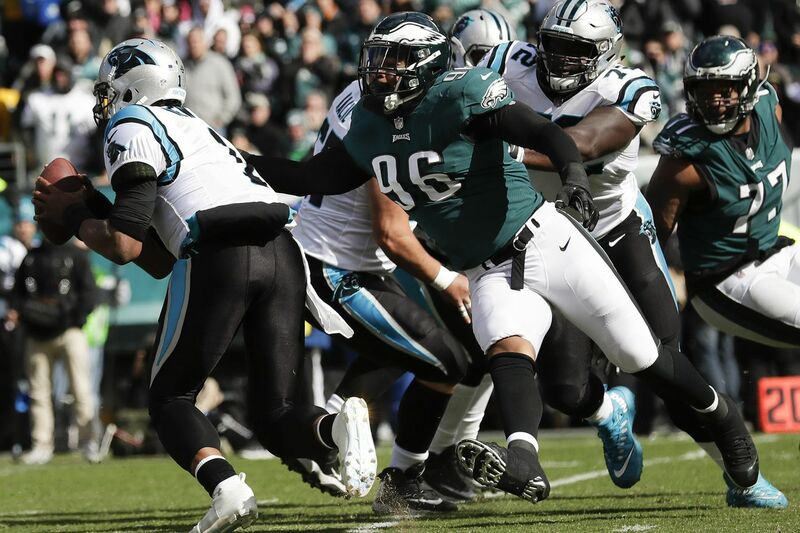 Derek Barnett goes after Panthers quarterback Cam Newton on Sunday. The second-year defensive end suffered his injury in the Sept. 30 loss to the Titans. Jim Schwartz talked to reporters for 18 minutes Tuesday about a bunch of stuff, from why his defense has collapsed in the fourth quarter twice in the last four games, to how offenses are being more aggressive on fourth down these days. Just about the only thing Schwartz didn't address was the news of the day, which broke about 5 minutes after he stepped away from the NovaCare lectern: Eagles defensive end Derek Barnett will undergo rotator cuff surgery and miss the rest of the season, according to reports from ESPN and the NFL Network. The Eagles said Schwartz went into a staff meeting right after he spoke and that they would not comment on "a report." Head coach Doug Pederson is scheduled to speak with reporters on Wednesday. Barnett, 22, was the team's first-round draft choice in 2017, 14th overall. He suffered the injury in the Eagles' 26-23 overtime loss at Tennessee, a very similar meltdown to last Sunday's. Barnett missed the next game, a loss to the Vikings, then returned to play against the Giants and the Panthers. It was Barnett who scooped up the Tom Brady fumble that Brandon Graham created, helping nail down the franchise's first Super Bowl championship last Feb. 4. That play capped a promising rookie season in which Barnett, who broke Reggie White's career sack record at Tennessee, recorded five sacks while playing 41 percent of the defensive snaps. This season, Barnett became a starter, and he has registered 2.5 sacks and 17 tackles while playing 51 percent of the snaps. Those numbers might not seem irreplaceable, but Barnett goes down at a time when the Eagles' defensive line, thought to be the strength of the team entering the season, is desperately thin. Tim Jernigan, a 2017 starter at defensive tackle, has yet to begin practicing after offseason back surgery. Haloti Ngata, signed to replace Jernigan, has missed the last three games with a calf injury. DT Destiny Vaeao is on IR with an undisclosed injury. Against the Panthers, the Eagles started Treyvon Hester, a former Raider who came up from the practice squad Oct. 2. Playing behind him and Fletcher Cox was Bruce Hector, an undrafted rookie who has been up and down from the practice squad. "It's what you have," Schwartz said, when asked about Hester and Hector, and trying to maintain his defensive line rotation. "I don't want to say it's like drawing cards, but you play poker, you get the cards that you get. You can't turn all five of them in. You've got to play your hand. "I thought those guys did a good job in the game. … They were around the quarterback. I thought they did a good job staying active in the pocket. Some of our pressures, those guys were right around, either keeping the guy from stepping up, or making him counter-step, and I thought they both handled themselves really well." The Eagles have been using Michael Bennett, and to a lesser degree, Graham, inside on passing downs because of the defensive tackle injuries. That seems like something they can less afford to do now. This would seem to mean more snaps for fourth-round rookie defensive end Josh Sweat, who has been active for the last three games. Sweat played one special teams snap against the Panthers, after playing seven snaps against the Giants and eight against Minnesota. He has one tackle. Barnett's surgery could affect the team's offseason. The Eagles' defense runs off pass-rush pressure. He surely was projected as a bulwark of the unit by 2019, and now his progress has been interrupted. Is management now more likely to use a high draft pick on an edge rusher? Does a contract extension with Graham, who is 30, become a more urgent matter? Meanwhile, if anyone still cares about Schwartz's explanations for Sunday's debacle, he didn't provide any great, overarching reason for how his defense went from dominant to doormat. "On each of those [three successive touchdown] drives, it was like one play that we have to make, and we've had that at different times this year," Schwarts said. "Against the Titans, we had just a couple chances to be able to get a play to stop a drive. We weren't able to make it. We had a fourth-and-10 [Sunday], have to make that. "There have been different times over the course of our years here that that's happened. But we've always sort of picked them up and made a play somewhere else along the way; special teams made a play, offense made a play. And then this, we didn't get that done. … There was really nothing that continually came up." Schwartz said the coverages were no less aggressive than they had been when the Eagles were shutting out the Panthers. He said he blitzed more in the fourth quarter than he had earlier in the game. He alluded to the fact that the Eagles, who finished 2017 with 31 takeaways, have just six in their first seven games this season. "We haven't been taking the ball away," Schwartz said. "And I think there's a fine line there, and you always warn the players, sometimes chasing takeaways, chasing turnovers, puts you in worse position. You start giving up plays. Guys press too much. They go for the strip instead of the tackle, and you give up a bigger play, or they go for the interception instead of the [pass breakup] and you give up a big play. … You've got to temper that. "But I think that's probably the biggest thing. There are two things we can do as a defense. One is hold the score down, and No. 2 is put our offense in position to score, or score ourselves, and that's a thing that was a common theme for us last year that we haven't really been able to get our feet under us this year." On Tuesday, he lost the player who came up with his defense's only turnover of the Super Bowl.